A coach has one of the most unique positions in leadership to raise up the next generation in character, work ethic, leadership, dedication and confidence. This year our Coaches Leadership Event was held on February 2nd 2019, hosted by 12Stone® Church in Lawrenceville, GA. Almost 2,000 coaches and spouses with over 350 kids were in attendance for this leadership event! With 21 different sports represented across 350 different sports organizations in the greater Atlanta area, the 2nd annual event was a big success! 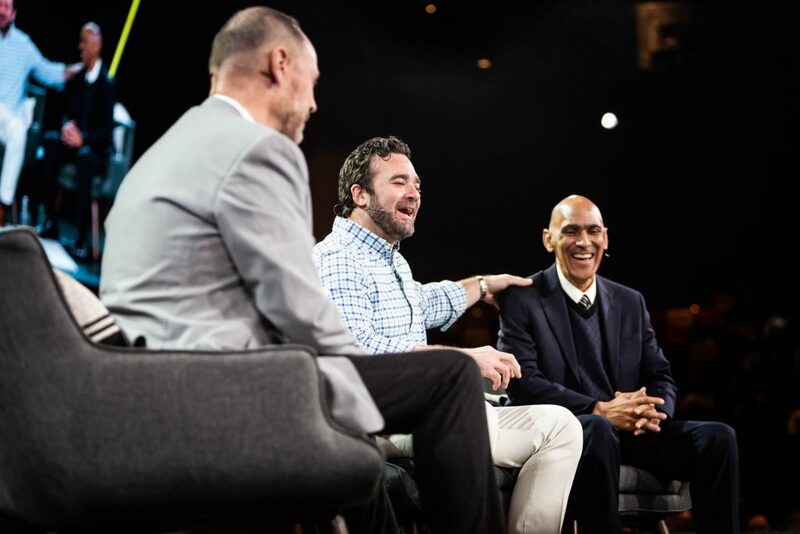 Hosted by TNT Sportscaster, Ernie Johnson Jr., the coaches were inspired and challenged by global leadership guru, John C. Maxwell, Super Bowl Champion and Coach, Jeff Saturday & Coach Tony Dungy! 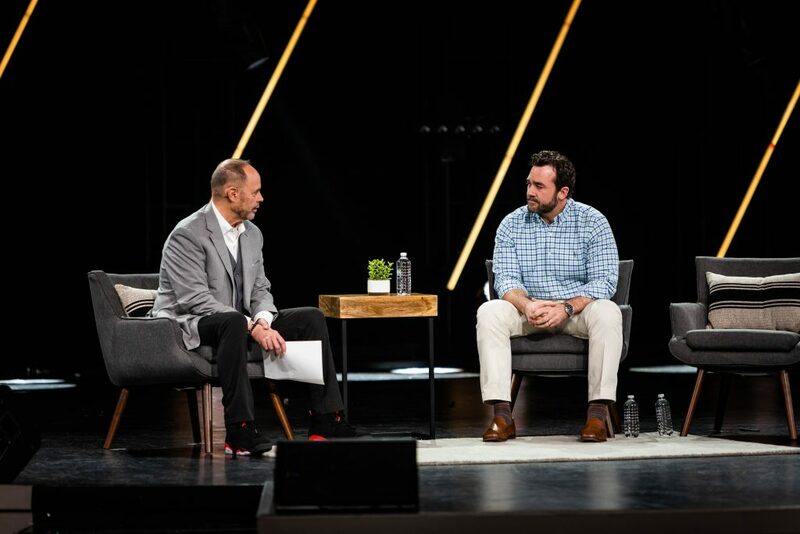 Whether you weren’t able to make it or were able to attend and wished you had taken more notes, enjoy some of the practices, insights, and principles shared below from EJ’s live interview with Jeff Saturday & Tony Dungy. Ernie Johnson: 4 All Pro Teams, 4-time Pro -bowler, 1 Super-bowl championship, what did it all mean to you considering where you have been? 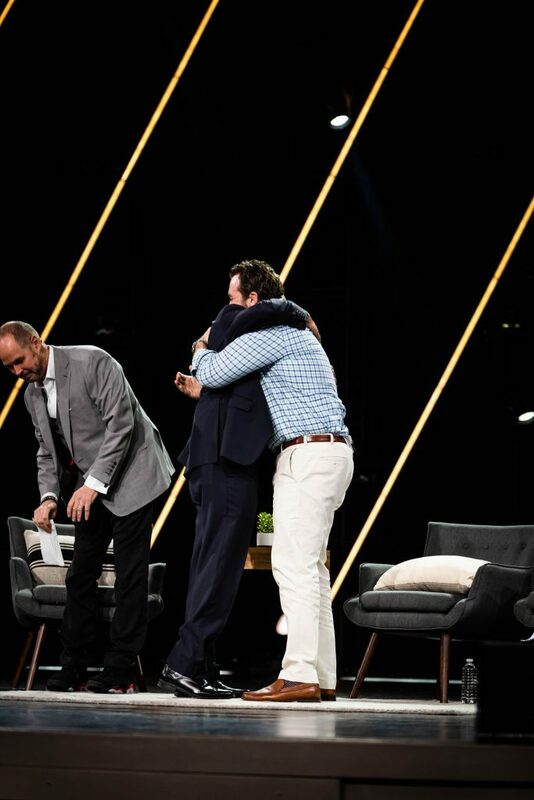 Jeff Saturday: It was all very surreal! I remember telling young guys how fortunate we are to have the opportunity and to make the most of it. My career was better than I deserved but the relationships I developed in that time were the most important. I have forgotten a lot about games, fans remember more than I do. When you are on those bus rides it’s the men you do it with and the camaraderie you do it with that sets it apart from anything else that you’ll ever be able to do. EJ: In the course of your career, growing up in the NFL, what makes a good coach? EJ: What’s a players Coach? JS: It’s all about relationships. Coaches who understand the journey from training to the end game. Have we all developed as a unit? Have we talked more about us then you or me? Players want to know you care. Your aiming point is to make them better in whatever field you can. EJ: What is the first thing you had to learn as a coach at Hebron Christian Academy? From the NFL to high School football coach. JS: I was a deer in a headlights and I am still learning. The reason that I wanted to get into H.S coaching was because of the camaraderie between us. The first people I reached out to were the coaches I was going to play against and the coaches in my area. I am calling these guys and asking questions because from the NFL to H.S I could only carry about 10-15% that will translate from one game to the other. I have learned a ton about football and a ton about leadership in this short time. I have so much respect for the men that do it and the men that sacrifice their family time and their lives to pour into others. EJ: How do you deal with the parents of the athletes you coach? JS: This is where I use my 10-15% because I know I have been there. The one area that I walked in with credibility is that I can look at any student athlete and tell them I have been where you are, and I have been where you want to go to. Whether it’s to get a scholarship in college or to have the longevity of a career as a professional athlete. I have sat in the same seat that they are going to have to sit in and I can help them on that journey. I look at the parents and I tell them the exact same thing. Listen I love your opinion, but your opinion doesn’t help me help your son or daughter. They don’t always take my advice, but I am pretty stern. I tell parents that if they are going to call me then I am going to be brutally honest. EJ: Tony when we think about your style of coaching, you have always said that faith & family come before football. How difficult was it in the NFL atmosphere in dealing with GM’s and owners and the win loss columns, how have you stayed true to yourself? Tony Dungy: It wasn’t hard as an assistant, I was fortunate to work for some wonderful men like Chuck Noll. My very first coaching job, I was 25 years old and had never coached before he hired me on the staff and I said, “Coach what do I do, what’s my job?” and he said “You only have one job, help your players be better.” That was the beauty of it, it was so simple. I coached under that for 10 years. EJ: How did he get through to you Jeff? JS: Even though he doesn’t raise his voice he has a way of letting you know that he is disappointed in you. The dad look. He implemented family Saturday, win or lose my family was with me in the locker room, when we hit the knee to pray, they were there. The example that he led by, it wasn’t just ownership, he stood against all and it didn’t matter what pressure came and that’s why you will follow him. You know that he is for you all the way. EJ: Tony how would you tell coaches in here is the best way to motivate? TD: I always believe in instructing what’s already there. Show the guys what it takes and what’s at stake. Here’s what we need to do and if we do it, we will be successful. I always thought you had to have a larger purpose. If all we do is win, it’s not going to matter in the long run. We have to win the right way, we have to win together as a unit and we’ve got to stay together, you guys have to be the role models for the young people. If we have the feeling that we are in it together then nobody can beat us. That was our motivation. EJ: How did you manage this perception, what were your hours like? TD: The thought is to be home at 7pm every night winning super-bowls while balancing time with the family. It wasn’t the hours, it was working smart and being precise. Staying true to this conviction was important to me. EJ: Best advice I received was from Roger Thompson and he said that the best advice to coaches was “To know your players, to be honest with your players and do not compromise your values.” Pretty good advice right? TD: The best advice I got was from Coach Noll. “Welcome to the NFL, you are getting payed to play football so that makes it your profession but it’s not your life. Don’t make football your life. “Winning games is not as important as winning life.” It became what I wanted to pass along to my players and what Jeff will pass along to his players. JS: He would say that to his coaches in front of the players. He would say “I want you in the community, I want you rounding out who you are as a man, if you are here you are not getting better as a man you’re going to get better as a football player but ultimately you better be in the community.” He would talk about the commitment, momentum and what we had to have as men in the community. It was also the authenticity in which he did it. EJ: I know you learned the value of every single person on the roster. How do you get the 53rd kid on the roster to feel like the number 1 kid? TD: Again, from Coach Noll “Everybody’s job is important, nobody job its indispensable.” He made sure we understood they we all had something to look up to, everyone’s job is important. EJ: How do you develop and get to know everyone on the team? How do you build that relationship? TD: Making sure I coach those players back up after losses. Just letting them know I am available and I am here for you. It’s making sure they understand that I am with them on anything. EJ: How about disciplining players? How do you remain consistent? TD: I stayed consistent with my word. JS: Tony would say this: “Men I love all of you equally but if you don’t follow the 5 rules, you’re telling me you don’t want to be on the team. TD: Everyone has a job, set the expectation and set the tone. EJ: During the tragedy of loosing your son, how did you get through that and how was your team family a part of that? TD: I was honest with the guys. Everyone is not always going to be perfect and if our faith can only be on display when everything is great then it’s not really faith. It has to be there when things are tough too and it gave me chance to display that. It also gave me a chance to say to them that’s why we go home at night. That’s why we are not here all hours of the day, that’s why winning is not the absolute most important thing in the world because those relationships are special. Our family knows we will see him again and be together, we were sad, but we were not sad for him. JS: I remember calling him that day, he said “Jeff he’s gone, we are heartbroken, but we are going to celebrate his life.” I remember it being the greatest testimony. I had seen him in high times and then I have seen him in what you would consider the worst moment and he didn’t change. The hurt and pain was there but he continued to shepard us and would say things like “Love your children, love your wife, spend time.” What a wonderful example and God-fearing man. EJ: Whats the major takeaway for coaches tonight? What is the advice about getting better at what you do? 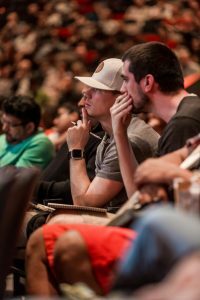 TD: It’s helping your players grow as people. If I have a chance to coach Jeff Saturday for 7 years and he’s a better football player when I’m finished but he’s not a better person I’ve waisted a lot of time. If he’s a better person after the time he’s left me then I am doing something right. To know the impact you can have on a young person’s life and to make a difference is a great responsibility, but it is gratifying when it happens. You guys can have a tremendous impact. JS: My HS coaches had the largest impact on my life and are the reason I wanted to coach at this level and why I chose to coach this level. I would say that your impact in changing men’s lives is great, there is not a greater opportunity that we have. In 30 years if you are still talking to that player you’ve won. I don’t care what your record says, you win. What I don’t forget is relationships, and I hope every coach in here understands that the relationships you have with your players in 20 years is because of what you have sown into their lives. The reason I love each one of you is because of the impact, we are all competitive, we all want to win, but in 20 years let’s all look back and look at lives changed and know crowns in heaven for everybody there.